Under Action, click the downwards pointing arrow to the right of the box, and select the appropriate digital message action for the rule, for example, Have not clicked. Contacts that have been included in the delivery list. Contacts that have not been included in the delivery list. Contacts that have opened messages. Contacts that have not opened messages. Contacts that have clicked on a link in messages. Contacts that have not clicked on a link in messages. Under Time frame, select when the digital message action should have taken place. If you select ALL, the number of relevant contacts in the database, which is displayed to the right of the page at the top and bottom, reduces as each condition is applied. If you select ANY, the number of contacts increases. See Combining conditions within a rule for more details. The subject of the delivery. Enter a numerical value, if appropriate to the defined operator, in the remaining box or boxes. For example, If you have selected Not equal to, there is one numerical field. If you have selected Between, there are two numerical fields. If you have selected is null, the numerical field cannot be edited. See Operator types for more details. Continue to define the pre-configured conditions as required. Enter the required subject, for example, Welcome, in the text field.The system displays the number of contacts in the database that match the condition/s. If, for example, you want to search for two subjects, such as Welcome and Happy Birthday, you can either create two rules, or set Match to ANY and add another Subject condition. See below for details about adding further conditions. The conditions that are initially displayed are configured on a customer-by-customer basis, when the system is set up. They can be changed at any time, using the Segmentation settings page, which can be accessed through the Settings tab in the Control bar. 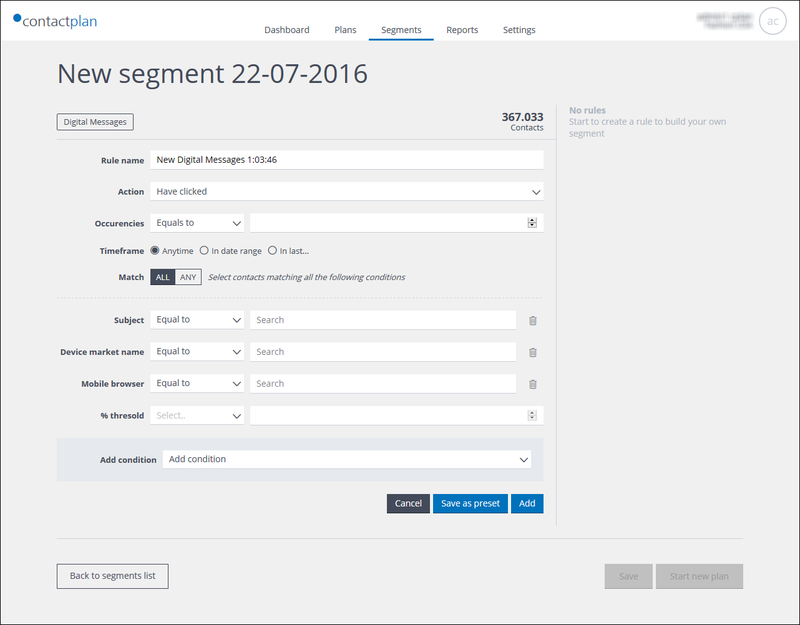 See Segmentation settings for more details. In the Add condition panel, click the downwards pointing arrow to the right of the box, and select the appropriate condition, for example, Country code, from the drop-down list. A free text search field. A drop-down list or a drill down enabled list. A date and time field. The % threshold condition is used to identify contacts whose activities satisfy a percentage range that is applied to a specific event type, while also meeting the other conditions defined for the rule. For example, contacts who have opened messages with the subject Special Offer on more than 10% of the occasions that they have opened messages.